We got first snow in late October 2012. November was mild without any snow, but then the winter started with a bang in the end of November. December was fairly cold and very snowy. January and February were slightly volatile months, but still very much wintry. Now, enter to March, and the winter's end is getting near. Or is it? No! This month is shaping up to be the greatest month of this winter. We have had even more snow and several cold nights, with temperatures as low as -25°C here in South-Western Finland (winter's record was in Taivalkoski, -38.2°C). And what is really incredible, looking forecasts there is no end in sight! I started riding from home right after the sunset. The temperature was going down rapidly, but riding felt awesome. On the trail to Karhunmäki laavu (shelter), from where I would continue to Hirvikallio where Peter's campsite is. To my surprise, I was able to ride almost all the way to the shelter. 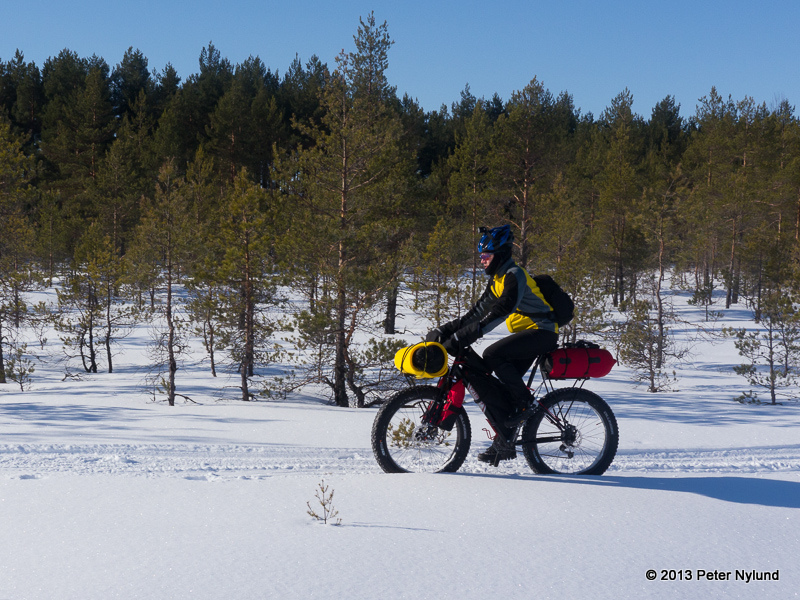 There are not many signs from the Karhunmäki shelter to Hirvikallio, because the route crosses the mire on duckboards. Therefore I was a little unsure about my direction, but I knew that Peter wasn't far away, so I called him and actually I could hear his voice from the distance. ...and he made and ate pancakes! 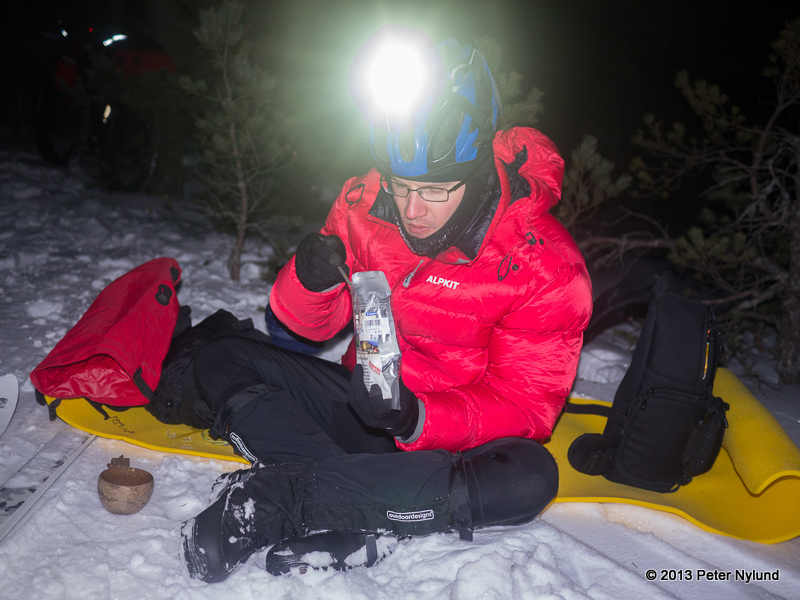 I was hungry too, and I was prepared with a freeze-dried meal, but I was a little envious about the pancakes. Soon it was time to go to sleep. Peter's bigger tent is already familiar to me, we spent two nights with it on the Ice Journey trip in 2011. To make sure that I would be warm during the cold night, I had the full winter sleeping system with me, including the new Brenig outer bag. And warm I was. I slept the night fairly well. The morning was very cold. And the morning was very beautiful. We deciced to do a little photography session on the mire before breakfast. Click on the photo to see them in full screen! Back on the campsite for the breakfast. As the sun was rising higher, it was getting noticeable warmer. We packed our stuff and headed to the mire. The plan was to follow Peter's track, but they weren't strong enough, so I rode on the side of the groomed ski track. Peter continued to his car, while I enjoyed the stunning day on the mire. It takes some skill to ride on the side of the ski track, but it's possible and fun. Then I followed my nightly tracks back to the shelter. And more great riding to the forest road. A short break, higher tire pressure, and I headed home. What a great trip, March at it's best! Thanks again Peter for the company, check out his blog report here.